We all have jobs that we want to see in Final Fantasy XIV. Some of them are pretty much definitively going to happen (I would be very surprised if we didn’t see Samurai, especially since every game in the franchise with jobs bar Final Fantasy III has it). Others are possible, but part of the grand morass of possibility without any certainty. And some of them are just plain pie-in-the-sky thinking, like my desire to see Enhancement Shaman Only In FFXIV And Hopefully With A Shorter Name Than This. But then there are the jobs that have the series pedigree to show up and all the reason in the world to be there… but probably won’t ever be added to the game. Today, it’s that list that I want to tackle. If you’re holding out hope for one of these to be added to the game, I don’t want to tell you it’s never going to happen, but I would advise you to acquire some slightly more realistic hopes. It doesn’t look good. There is an entire article to be written about the saga of how broken Blue Mages are in Final Fantasy XI. Not here and not now, but boy, it does give them a certain pedigree. The job could in theory fulfill almost any role, yet it’s a de facto physical damage dealer because it manages to do that better than almost any other job, and that’s not even getting into its insane utility as an area damage dealer. It’s a bit overpowered. But none of that would in and of itself keep Blue Mage out of FFXIV. No, what serves as this job’s main impediment is the simple reality that Blue Mages don’t learn the way that every other job does, and that disconnect is going to be pretty significant. Certainly, the lack of a defined role hurts the job somewhat. From the first appearance of Blue Mages in Final Fantasy V, it’s never been quite clear what a Blue Mage is supposed to be in the same way that even a Red Mage manages. But that’s not inherently going to prevent using the job, since all it takes is just a declaration that Blue Mage is serving as a healer, or a tank, or a damage dealer. Any of the above could have the case made convincingly. Yet a Blue Mage learns by experiencing what monsters do. That’s the defining attribute of the job. You can’t have a Blue Mage who learns new spells or abilities just by leveling up; it cuts down the whole core of the job’s identity. Every trick a Blue Mage knows comes from a monster. The closest we could get would be having every job quest add a new ability after a particular monster fight… and even that doesn’t feel like a very good match for what the job actually does in every other game where it appears. There are a few abilities that serve as iconic blue magic that would likely port over just fine, but it wouldn’t be much of a Blue Mage unless it rewrote the entire pattern of ability acquisition. It’s unlikely to ever hit the game. Some jobs you love even though they’ve never been very good. The best incarnation of Mime was in Final Fantasy V, when the job was basically there to soak up all of your spellcasters. In most versions, it’s interesting, but it never turns out to be terribly useful; having a character do exactly what someone else is doing is rarely a viable strategy. Still, the mimic command enjoys its occasional day in the sun, and it’s certainly one of the more interestingly unusual jobs among the long-time franchise selections. Unfortunately, it never had much chance of showing up in an online game, and that’s even assuming that the obvious latency issues of mimicry could be easily solved. Whether or not that’s the case is up for debate; whether or not it’s worth trying is less so, because no matter how you designed the job, at best it’s the problem of making your job into a copy of someone else’s job. That’s the very nature of Mimes. Mime, as a command, becomes useful in situations where having that second use of an ability is otherwise impossible, because the first use is somehow limited or because you have something else neat going on like copied limit breaks. But there’s not a whole lot of space to make a character who just does what someone else in the party already does. I may be the only person who wants Mime anyhow, so this might not be as much of an issue as Blue Mage. Let’s go back to something a little more contentious, then. Dancers and Bards have always occupied an interesting place within the job pantheon. Final Fantasy Tactics is, to the best of my knowledge, the only game in which the two jobs were specific opposite numbers to one another, but the general sense has always been that Bards bolster the party, while Dancers cripple the enemy. Final Fantasy X-2 combines both jobs into one and has them accomplish those two functions quite well as a result; the dances hurt, the songs help. FFXI had a versatile Dancer, but first and foremost, that’s still the role Dancer fills. It can handle some backup support healing here and there, but it can’t be the sole healer for the party; it occupies the same damage-and-utility spot that Thief and Corsair do. 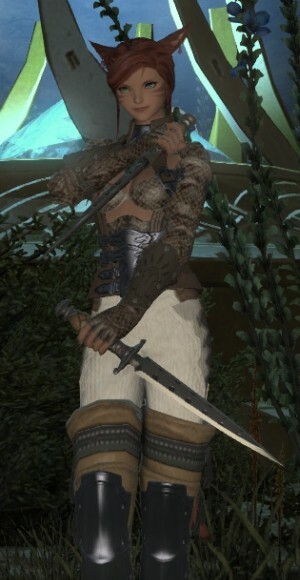 But it seems like such a natural spinoff from Rogue that it keeps getting tossed out there, even though by all accounts there wouldn’t be enough space to make Dancers and Ninja fulfill different roles in FFXIV even though they could feel different enough. We’re unlikely to see Dancers because however much neat imagery they might have, at the end of the day they’re not different enough to occupy a new space compared to Ninja. They might offer slightly different pieces of party utility, but that alone isn’t enough to justify an entirely new job. We already have a job that dual-wields daggers as a physical DPS, and a dedicated debuff role isn’t likely to happen just for Dancing. This one seems to come up a lot from Bards who want to be long-range death machines rather than the party support that physical ranged damage has become. And series-wide, there’s precedent for this. Rangers were fearsome damage dealers and pullers both in Final Fantasy XI, Wakka was arguably one in FFX (and served as the party’s heaviest attacker), and it’s not like getting shot with an arrow just tickles. However, as it stands, we do have three pretty well-defined spaces for damage dealers in the game, and if you’re at range without spells, you’re going to be serving as party support. It makes sense, too; you get to ignore a lot of mechanics that are rather dangerous in melee range (there’s a reason I play Machinist when I don’t feel like screwing around in the paint), and you don’t have the AoE and spot defense capabilities of the casting DPS jobs. From a lore standpoint, there’s also justification. No job transition is ever as simple as “the base job, only more,” not even with the relatively straightforward move from Conjurer and Thaumaturge to White Mage and Black Mage. There’s less space to make for distinctly Ranger abilities compared to Archer abilities; it could be argued that Ranger is more of a cultural position held within Gridania rather than being an explicit job. Of course, I could be wrong on all of these… but the odds are against them. Want to wail and gnash your teeth in the comments? You can feel free, or you can mail me at eliot@massivelyop.com. Next week, we’ll have patch notes and a length downtime to fill up, so you know what I’m going to be talking about.